King Richard the Second is a history play by William Shakespeare. It is the first in Shakespeare's cycle of plays about the Wars of the Roses. The other plays in the cycle are Henry IV, Pts. 1 and 2 and Henry V. Shakespeare's source for the four plays was the Holinshed's Chronicles. Richard II is Shakespeare's only play written entirely in blank verse. 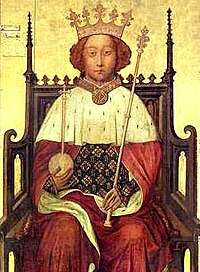 It tells of the forced abdication and murder of Richard II, and his murderer's rise to power as King Henry IV. It was written about 1595, and probably first performed shortly after the play's completion. It was first published in quarto form about 1597. Other quarto editions were published over the years. In 1623, the play was published in the First Folio. This page was last edited on 26 August 2018, at 00:58.